ABOVE: This map shows the most important items of interest on Venice's Piazzale Roma, which is the final destination for motorized traffic arriving in Venice. Every year, millions of tourists enter Venice through the Piazzale Roma. This utilitarian square, with its parking garages and lines of orange ACTV buses, lies on the Venice side of the long causeway from the mainland. 2) Motorists who are naïve enough to endure long lines at the Piazzale Roma's garages instead of using the more manageable Tronchetto parking island on busy or weekends or during high season. 3) Members of tour groups (although many tour buses discharge passengers at Tronchetto for transfer to vaporetto, water taxi, or private waterbus). 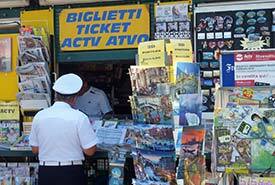 ABOVE: You can buy bus and boat tickets at the newsstand near the buses or at the Hellovenezia building nearby. You can save money--and avoid crowded boats during high season--by simply walking to your destination. Before setting out, buy a good map at one of the newsstands in or around the Piazzale Roma. If you have an early airport departure, are staying in Venice overnight before or after a cruise departure, or are visiting the city for only a day or two, a hotel near the Piazzale Roma may be convenient. Four hotels are directly on the square, and others are close by. Click here for hotel suggestions. Venice is served by two airports: Venice Marco Polo (the main airport), and Treviso Airport (used by Ryanair and at least one other budget airline). 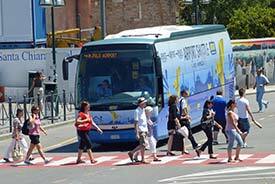 Buses to both airports leave from the center of the Piazzale Roma. 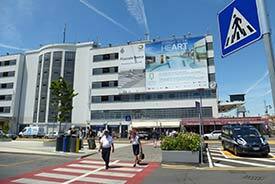 See our Venice Airport Buses article for details. Alternatively, you can hire a four-wheeled land taxi, but the fare will be much higher (and the trip won't be any faster) than with the bus. Land taxis are also useful if you're transporting heavy luggage to the cruise terminals. Look for cabs at the taxi rank on the tree-lined side of the square. ABOVE: The city-owned parking garage in the Piazzale Roma. Again, parking at Tronchetto is easier than struggling with the confusion at the Piazzale Roma--at least on weekends or in high season, when lines can be horrific. An even better option during high season is to park on the mainland and take public transportation into the city. For more information, including links to the parking facilities' Web sites, see our "Parking in Venice" article. This page has links to our articles on Venice's vaporetti (water buses), airport boats and buses, car ferries, gondolas, and Marco Polo Airport. These hotels are on or extremely close to Piazzale Roma, where buses offer service to the Venice Marco Polo and Treviso airports. Seven of these hotels are on or extremely close to Piazzale Roma, and three are near the San Basilio and Santa Marta cruise piers.